Wetlands such as those found in Skipanon Forest filter out sediments, excess nutrients, and pollutants. Skipanon Forest includes land on both sides of nearly a half-mile of the Skipanon River where it flows through a forest of Sitka spruce and native crabapple between Warrenton High School and US 101. It is just upstream of our Little Skipanon property and east of our Skipanon Wetlands property. 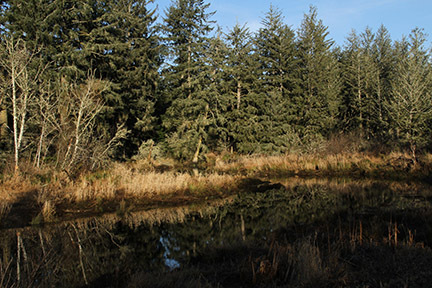 The spruce forest-and-swamp habitat type that characterizes the property is considered globally rare; three-quarters of the forested and scrub-shrub tidal wetlands that existed in the lower Columbia River estuary in the late 1800s were gone by the 1980s. Wetlands such as those found in Skipanon Forest act as nature’s kidneys, filtering out sediments, excess nutrients, and pollutants. By storing water, they also protect natural and built environments by tempering the effects of storm surges and flooding.